Eating healthy food provides the nutrients you need. You lose weight and your internal systems get a big boost from the natural vitamins, minerals, proteins, carbohydrates, fat and fiber. Fruits can be used as excellent easy snacks. They will satisfy your craving for something sweet and juicy. You should always have oranges, pears, apples and pineapples in your kitchen. Splurge on whatever fruits are in season to enjoy a variety of tastes and textures. Nuts are great snack food as well. They do tend to give you additional calories but when taken according to serving suggestions, you’ll benefit from their fat content, which is good, monounsaturated fat. So, if you want to snack on fruits and nuts, you’re in for a big surprise. There as several choices to enjoy and you can create your own mix to have guilt-free fiber and protein-rich munchies when you’re feeling hungry and mealtime is still a few hours away. It can be difficult to make a choice because both are beneficial to your health. You can improve your cholesterol levels by eating nuts. Nuts provide you with fiber, protein and omega-3 fatty acids to help curb your hunger. What you have to keep in mind is to eat nuts in moderation. Almonds have non-fat content such as fiber and protein and monounsaturated fatty acids. Almonds also have the lowest calorie count of 160 per ounce among nuts. A serving of almonds (23 pieces) has 14 grams of fat and 6 grams protein. For heart health, walnuts can help. Fourteen halves of walnuts contain 4 grams protein, 18 grams fat and 185 calories. Walnuts have high amount of alpha linoleic acid (ALA) and believed to be as effective as olive oil in reducing oxidation and inflammation in the arteries. As a snack, it is recommended to have eight walnuts a day or 4 pieces per serving. Peanuts are good for the brain, as they are high in folate, vitamin E and brain boosting fat. Brazil nuts have high amounts of selenium, which may help fight prostate cancer. One Brazil nut has enough selenium that you need for the day. Also helpful in relieving symptoms of prostate enlargement are pecans, which are high in beta-sitosterol. Fruits provide you with plenty of vitamin C that is good in fighting inflammation, strokes and heart diseases. An apple has 70 calories and more than 3g of fiber. Eating an apple with skin gives you 1g fat, 1g protein, 3mcg vitamin K, 21g carbohydrates. Apples do not have saturated fat, sodium or cholesterol. Mix apple and pear slices for a more filling snack. For a good dose of fiber and vitamin C and other nutrients similar to what you get from pears and apples, eat peaches and apricots. Berries are called little fiber bombs and are nutritionally dense fruits. So you can always have a serving of mixed berries such as gooseberries, salmon berries, huckleberries, blackberries, raspberries, strawberries and blueberries, as they contain several vitamins and rich in antioxidants. Fruits are rich in vitamins A and C and eating them lowers the risk of chronic health conditions, cardiovascular ailments and diabetes. Consuming fruits in every color ensure that you get a good supply of minerals, phytochemicals and vitamins. 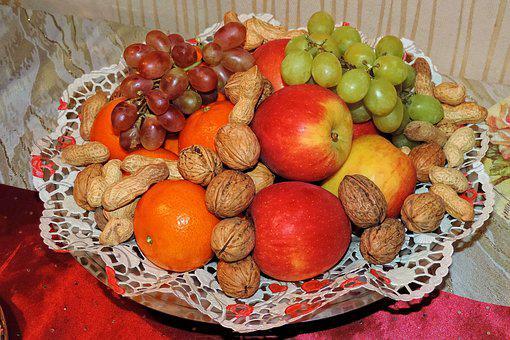 Nuts and fruits provide you with high quality calories so you do not gain weight. They supplement the daily nutritional elements your body needs, stave off hunger and help prevent a variety of diseases that affect your cardiovascular, respiratory, digestive and immune systems.